Can You Really Make Money Writing For Scotch.io? This is a website that I found while researching new and better ways to make money online—though this happens to fall under the realm of ‘freelancing opportunities.’ Can you really make money writing for Scotch.io? As it turns out, you can… but let’s just slow down and talk about it for a minute here. Freelance writing isn’t always the easiest way to earn extra cash—but it is absolutely one of my favorite ways to do so. Freelance writing is not easy because not everyone can do it. I mean, anyone could do it, but many people do not put the time or effort into learning the skills required to succeed as a freelancer. The thing about writing is that it does require skill and practice. And to get better at it, you have to actually do it. So yeah. If you have an interest in freelance writing and feel like you are up to the challenge of pitching an article or two, then this opportunity might be for you. If not, then you may need to find a different side-hustle. But for those of you who do feel like writing-for-hire may be in your destiny, here is what I learned about Scotch.io. The large color-changing banner across the top of the site should also tell you a little something about what the site is actually about. And that is what Scotch.io is about. 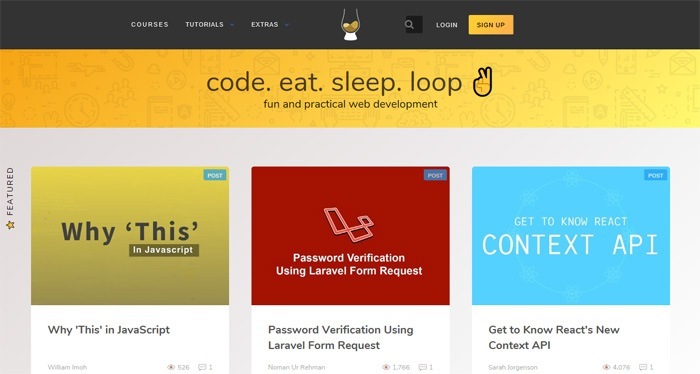 It is about coding and web development. They offer courses, training, tutorials, and a blog that readers can visit and peruse at their own leisure, both to learn and to be entertained. On their ‘Write For Us’ page (yes we will get to that in just a minute), they make it a point to say that they care a lot about quality, and that they accept fewer than 10% of authors who actually pitch articles to them. I decided to read through some of their content, just to see if this was really the case or not. I love it when websites focus on quality content, but I still always feel the need to check it out for myself. Here is what I found. So yeah. These were pretty technical titles as far as I was concerned. And upon looking inside—yeah, I found the same thing. This was techie/coder stuff. I took a look at some of the articles, and honestly, I barely knew what they were talking about. But then again, I am not a coder, and what I do know about web development mostly has to do with the front end of the site, not the back end. I am a writer and dabble a bit in SEO… so my expertise lies elsewhere. What I can say, though, is that this content is very well done. To be a bit more accurate, it was actually literally perfect. I didn’t find a single error. The posts were simple, yet informative—and they were lengthy enough to get the job done without being too wordy. They were also formatted beautifully. The point of all of this is to say that, yes, this site absolutely shows that they value high quality content. This is absolutely manifested in the articles that they publish. With those things being said, I also feel like it is worth mentioning that this site looks extremely professional. I feel like it would be a very positive accomplishment for any writer to get published on Scotch.io. It would look really good as a reference, and would no-doubt impress future clients. But what is entailed in getting published on Scotch.io? Let’s talk about that next. As it turns out, the easiest way to get to the ‘Become A Scotch Author’ page is to click on ‘Contact’ on the footer at the very bottom of the landing page, and then click on the highlighted link that takes you to it. The first thing they talk about here is that they have very high standards… which is obvious. They also say that they pride themselves on a rigorous approval process. With that being said, they also welcome newcomers to join their ‘growing stable of brilliant authors,’ but they also warn that they accept less than 10% of applicants. So only the best of the best actually see their pitches published. If you feel that you could accept this challenge, here is some more information that you should know. Here is a screen shot of the lower part of this page. It talks about exposure, guidance, and payment. This site pays out up to $150 per piece, which is super awesome! They also give you some great tips on actually getting your piece accepted, which is also a very welcome addition. They also make it a point to say that they do receive a pretty significant number of applications on a regular basis. So if they do not respond to your pitch within two weeks, it seems safe to assume that you were not accepted. Should you pitch to this site? 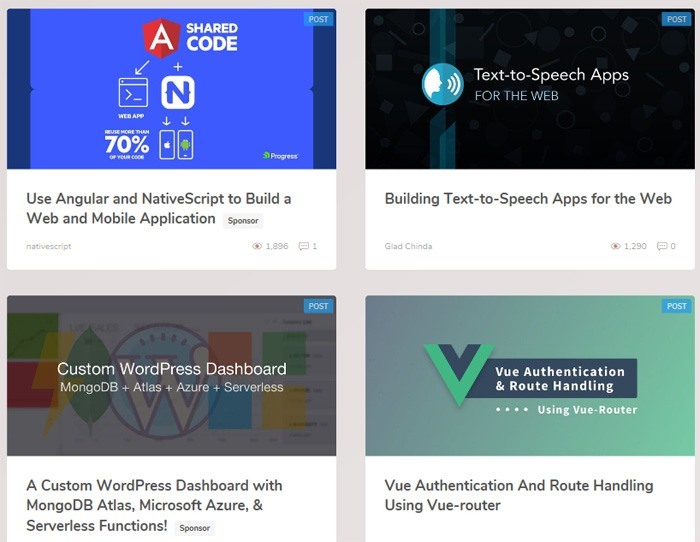 My obvious first question is this: Do you know enough about coding and/or web development to write with knowledge and authority on these topics? My second question is this: Are you ready to write a piece that is very polished, well-written, and well done? If you answered ‘yes’ to both of these questions, then yes… I do feel like pitching to Scotch.io is most certainly worth your time. First of all, they have a lot of viewers. So if you do get published on the site, it will do good things for your name as a writer. You can also use the publication as leverage to impress future clients—and that is a huge bonus. This is a very well-done website, and they seem to take professionalism very seriously—so if you are serious about freelance writing, websites like this (sites with an open casting-call for writers) are where the serious next-level action is. But they also pay you pretty well… and I can understand why. I have a feeling that it is hard to attract writers who are good enough without offering quality payment, which is likely why they offer up to $150 per article. Granted, these articles are usually probably close to 1,500 words long or longer, but $150 is still a very competitive rate for such pieces. Yes, the pieces will likely be technical, but still… if you are knowledgeable enough about the topics, then technical writing should not be a problem that kills the bottom-line for you. The application process is pretty simple, and you can go through it right on the ‘Author’ page. 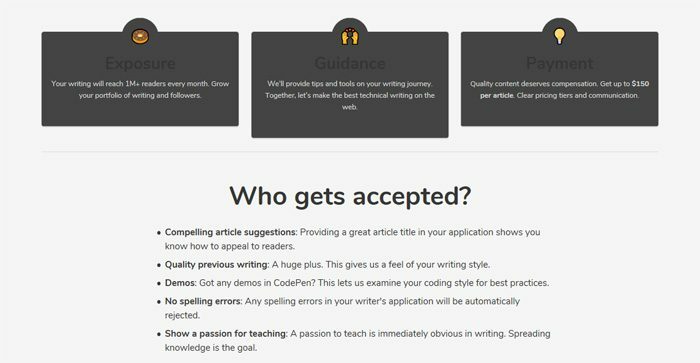 Can You Get Rich Writing For Scotch.io? No. Writing for websites like this can make you some decent extra money, but they will not make you rich. If you get good enough, it is possible that you could even carve out a decent full-time living writing for websites like this. But this is still a business model that requires you to work an hour to make your money. The holy grail of online income lies in passive income, which is income that you can set up to trickle in without requiring you to do anything. That, however, is a more involved process. This, on the other hand, is more of a great opportunity to earn some extra cash while you work toward that. If I felt like I could write knowledgeably about their desired topics, I would give writing for Scotch.io a try. Unfortunately, however, their desired topics are not topics that I am super good at—so I will leave it to the guys and gals out there who know what they are doing. But, it is still a pretty awesome website! Should you try to pitch them and make some extra money as a freelance writer?